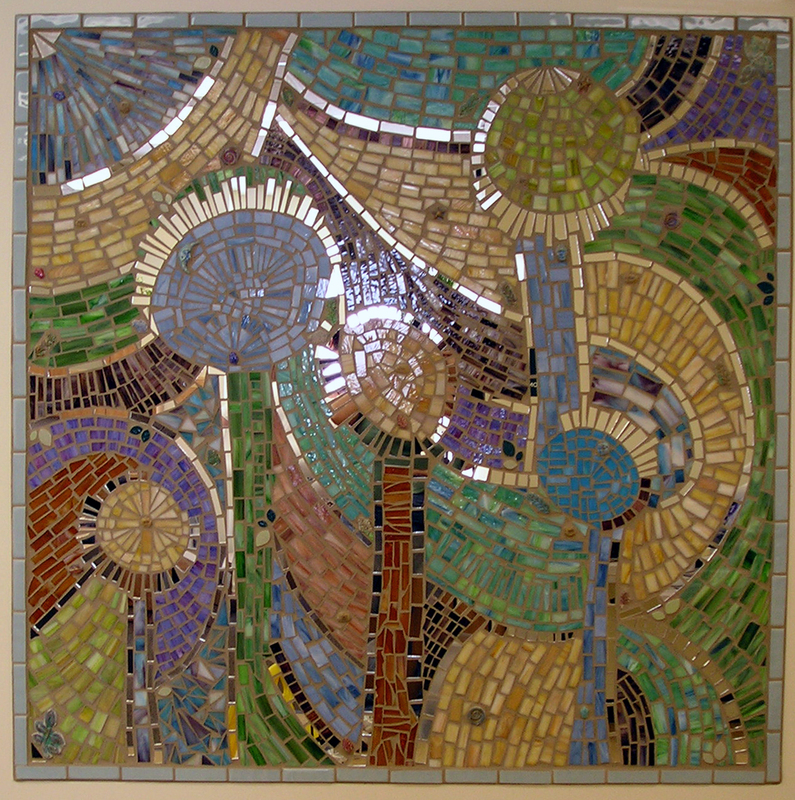 Along with Liz Nicklus, I create large-scale mosaic mural installations. One of a dual panels that we did for the health department in Gloucester County, NJ. A small installation, but really fun to work on. This was in the Health Department. We did two pieces, this is the main one. 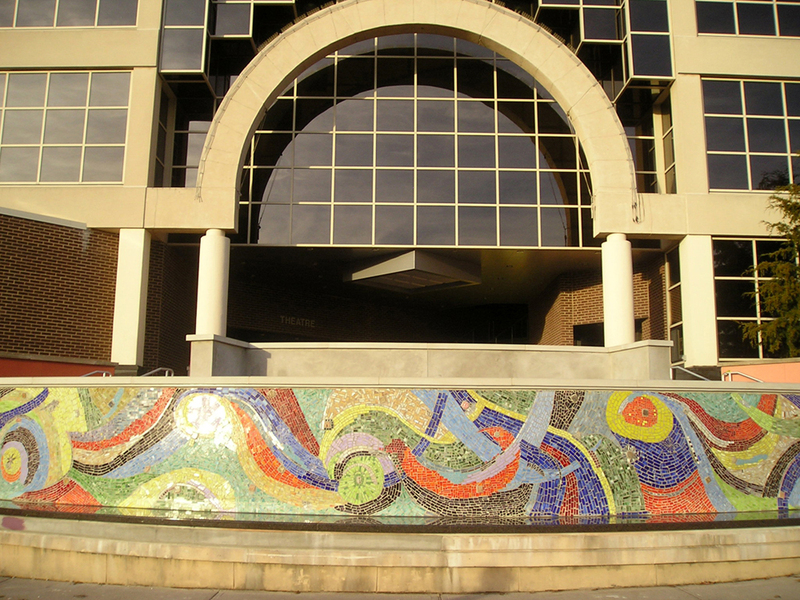 Before Raritan College, this was our last big work in New Jersey. 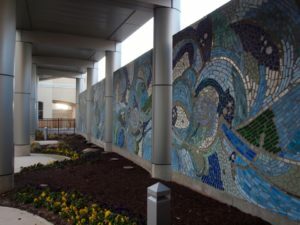 All of our mosaics are done on site, one piece at a time. We cut pieces to fit. Stained glass and ceramic, with tile. There are faster ways to do it, but we like to do it one piece at a time. I was dragged into doing mosaics. Not willingly… it was Liz’s thing. 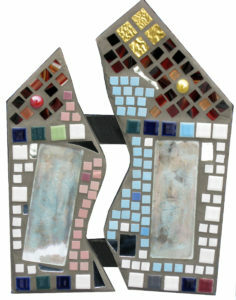 I did my oil painting, and found object sculptures, she did her multi-media and mosaics. But the deadline was crashing down on the AtlantiCare mural, 56-foot long, 10-foot high. She had an apprentice assisting, but I was dragged in screaming and kicking. By the end, I was hooked. I brought in the next commercial job… a friend asked us to do murals for an adult retirement center. I talked him into tripling the stipend, and we installed a three-panel permanent installation. We did a two-panel install after that, and taught classes in Key West. I did a really cool class with high school art students after that. Since then, we solicit public art projects. The best thing about this is getting paid for doing what we love. What do you do with an old table that has really no purpose? 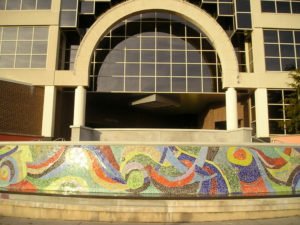 Mosaic it! 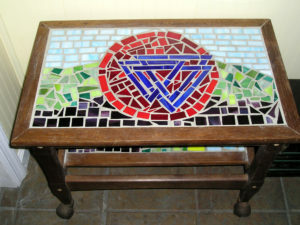 I focused on geometric patterns on this first table. I based the background on nature… sky, earth. Wood is tricky to mosaic on… it expands and contracts based on humidity. The terrazzo has to be adhered with mastic. Sanded grout is best. 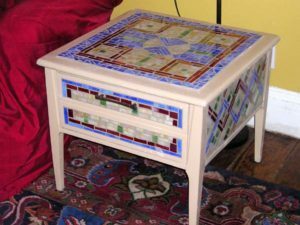 The other table I did was a crappy pine end table. It was so ugly, no amount of refinishing or paint would have helped it. One year during Artists Open Studio Tours I didn’t feel like painting. When I paint I get covered with oil paint and turpentine and linseed oil. And my paintings often do not make sense until they are completed. 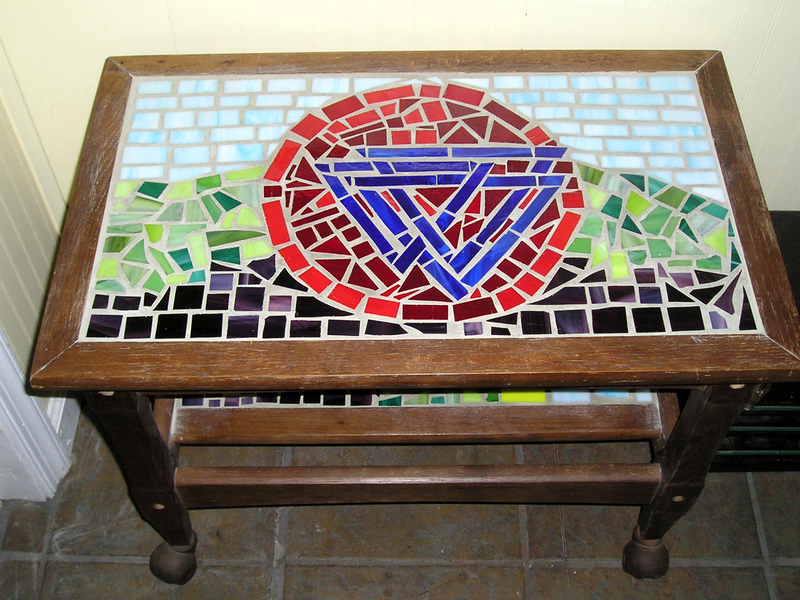 So I decided to mosaic an ugly old table. Again, geometric designs ruled. Just call me lazy. We had a floor that was bare plywood. Money was at a premium, when is it not? 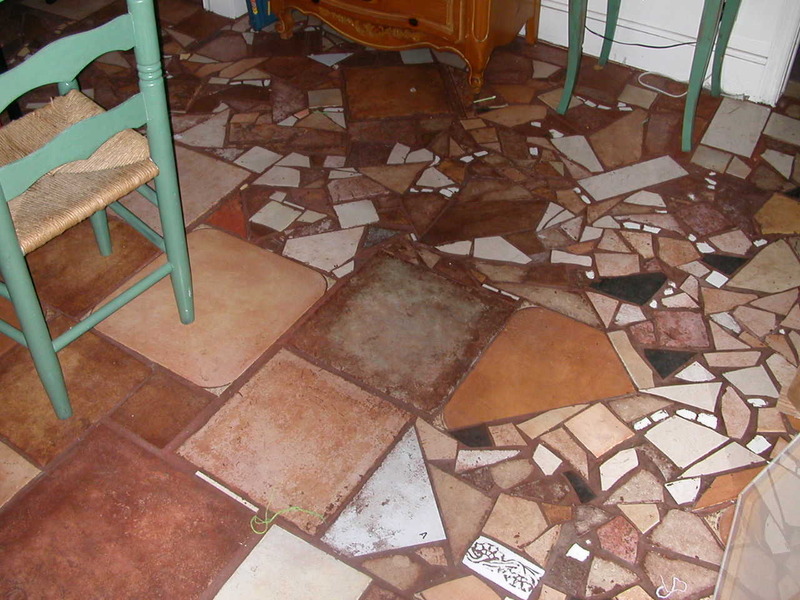 We had tons of sample tiles from tile stores, but not enough to tile a floor. What to do? Being artists, we did what an artist would do. 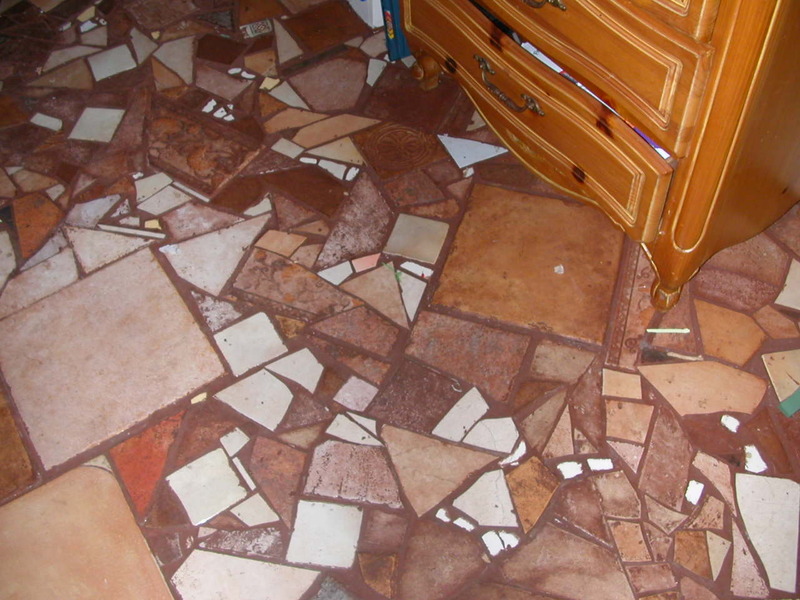 We tiled the 16′ x 20′ floor one day with broken sample tiles. 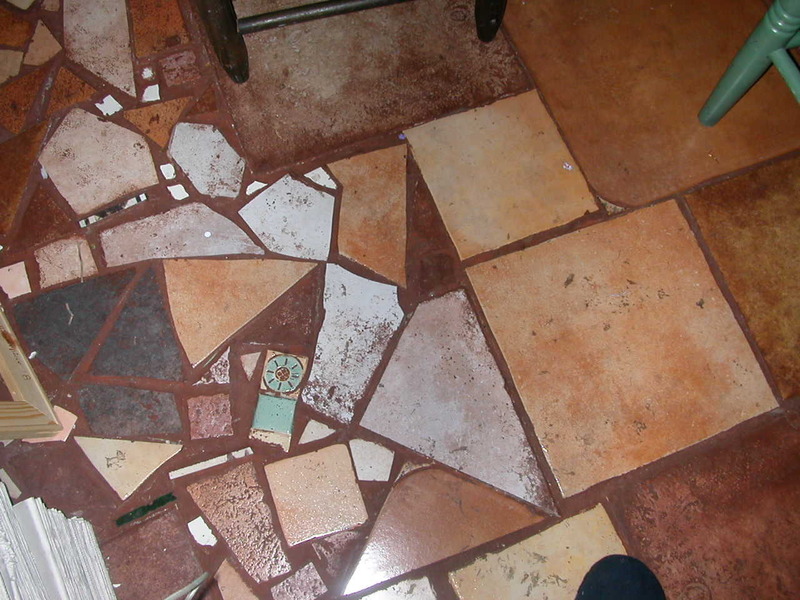 It took one day to lay the tile, and one day to grout. We chose mostly natural colors, with a few colorful tiles in between. 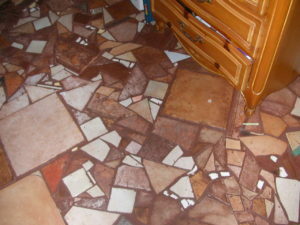 The tiles were free, we had to buy the thinset mortar. For under $100 and a couple days of intense work, we had a masterpiece. You don’t have to be rich to look like you can afford a work of art on your floor! 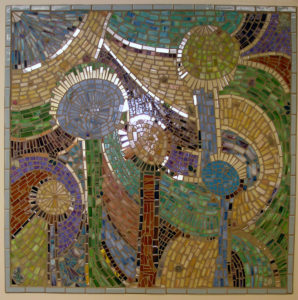 This was the first project I did with mosaics. It was not long before I was doing large scale public installations. Mixed media, found object piece. A local gallery had an exhibit where we were given a piece of wood shaped like a house. We had to turn them into a piece of art. 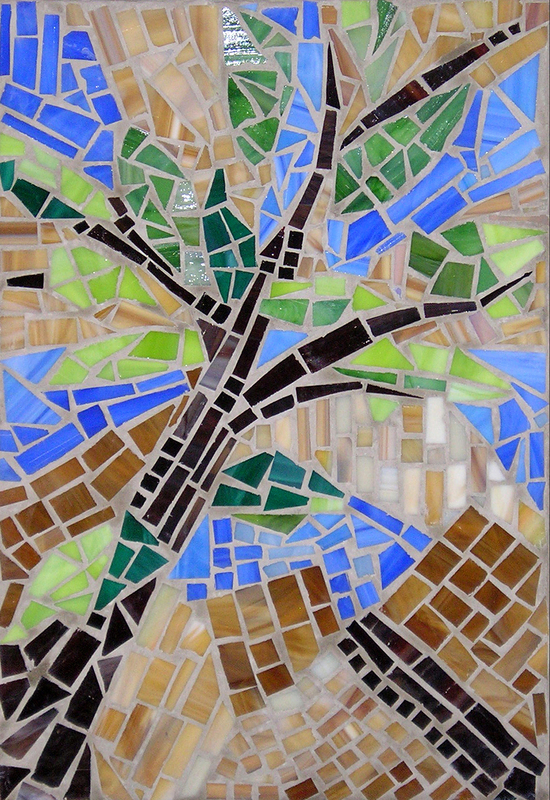 I laid old photographs under glass and mosaic-ed the rest. I usually don’t get involved in these types of shows, but as a board member I was sort of obligated. This was a personal project. We owned a house built in the latter part of the 1800’s. The house was an Italianate style Victorian house. Two living rooms, two bathrooms, two staircases (one for family, one for servants) three bedrooms, the house was huge. The dining room was almost 20 x 20 feet. It had carpet over plywood… we did not know what was under the plywood. Our friend, Norman, worked for a lumber supply company. They also sold floor tile. Every year the displays were replaced. Norman gifted us truckloads of old tile displays. 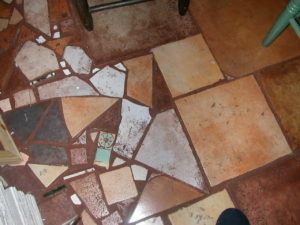 These tiles became our mosaic floor. Who says you can’t do a house on nothing?